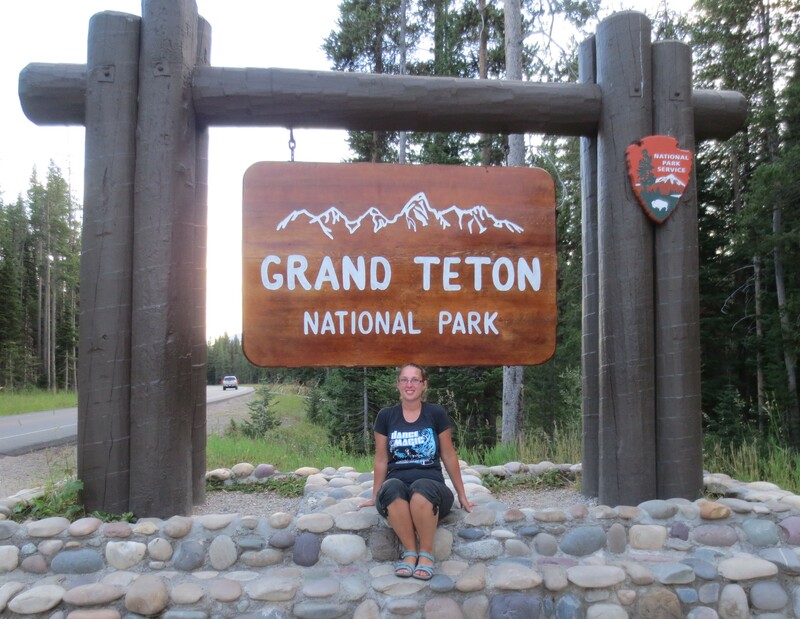 On Tuesday of our 9 day Western Adventure, we drove from the middle of Yellowstone National Park, to Jackson, WY. It was a beautiful drive, full of many stops. The Teton Mountains were beautiful!! One of my favorite scenic spots, was when we stopped at Colter Bay. 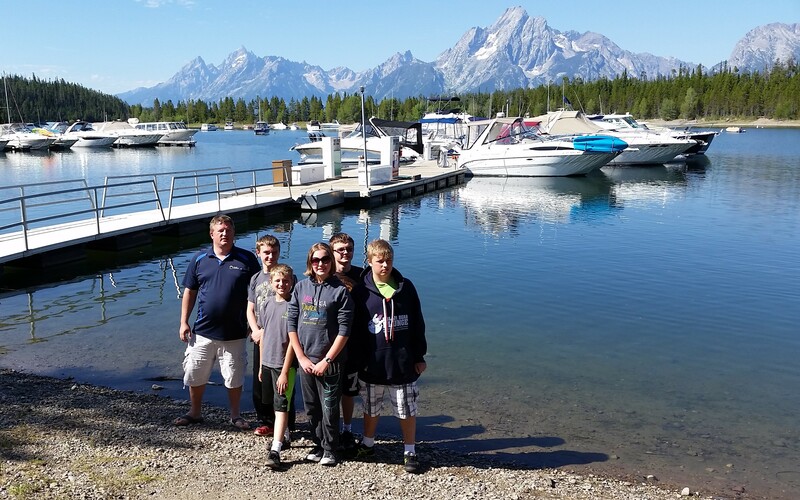 There are several things to do at the visitor center here, including read about the glacier on Grand Teton. The plaque showed a picture of the changes in the glacier over time. This bay was also just a beautiful spot overall! I would love to stay here for a few nights on our next trip this direction. 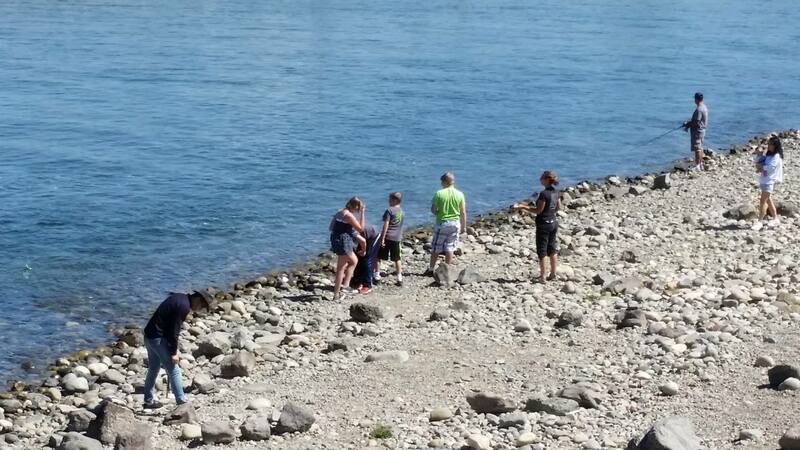 Jason and the kids at Colter Bay. Grand Teton and the glacier can be seen in the background. 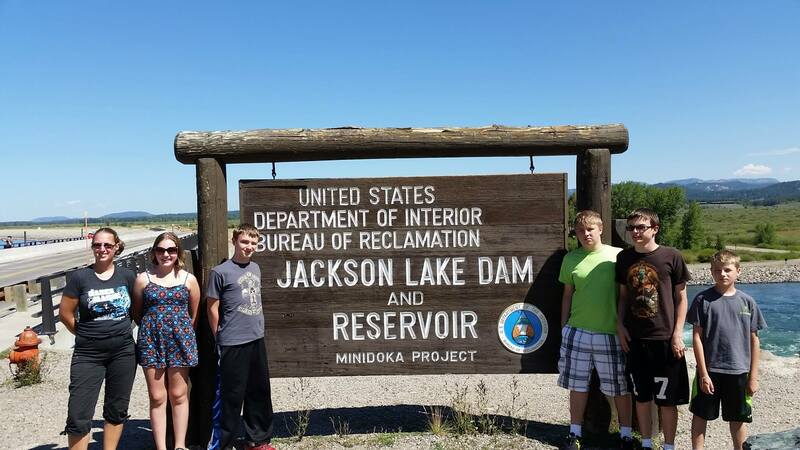 This area, below Jackson Lake Dam, was a great area to skip rocks, and play… we could have stayed here much longer! Eventually, we made it to our goal, Jackson. This was a cool little town. We spent much of the day relaxing in the park in the center of the town. The four corners of this cute little park were made up of four archways made entirely of elk antlers. The local Boy Scouts go out and collect the antlers that have been shed by elk, to be auctioned off in the park every year. When we weren’t enjoying the perfect day, we explored the shops all along the main street in town. The kids enjoyed looking at all the art in an art store. It felt like being in a museum made up entirely of original art based on wildlife, Native Americans, and nature scenes. There is a Ripley’s Believe it or Not Emporium, and a historical museum in town, but we didn’t go to either due to the cost of bring 7 of us to each. Pretty sure I have never seen so many flavors of salt water taffy! I’ll have several of each! 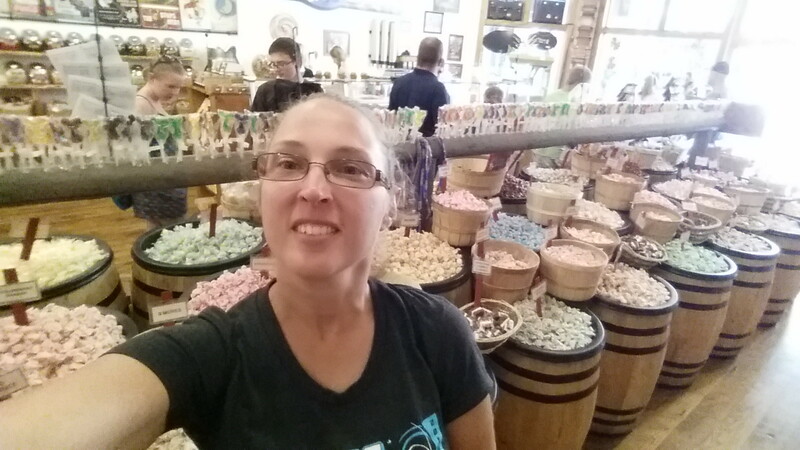 We discovered a GREAT old fashioned candy store with salt water taffy by the barrel full! There’s something special about getting to choose from all those flavors! The walls were lined with jars of all different kind of candy, many of which I hadn’t seen since I was a kid. There were even candies I had never heard of before! I LOVED that store (so did Grace)!!! After stocking up on candy, we ate dinner at a place called Pizzeria Caldera. While the crust was a little thinner than I cared for, it was delicious! We even tried bison pizza. Soo good! 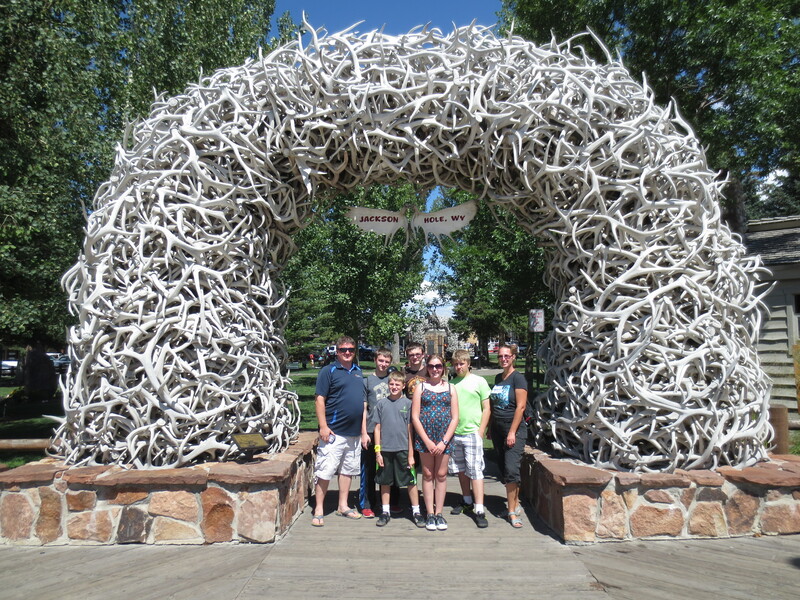 Our family, standing under one of 4 arches made entirely of elk antlers. Finally, it was time to head back to our campground in Yellowstone. We decided to take a back road, because there was a place “nearby” called The Aspens. Aspen really wanted to have his picture taken by the sign. Finding this place took us through Jackson’s rush hour traffic, and through the Laurance S. Rockefeller Preserve. We felt like we were not on the right road, because of how small it was. It did eventually bring us back out to a major road. While we hadn’t originally planned on taking this back way, we were glad we did. One of the things that quickly becomes a common part of driving through Yellowstone and the entire area, is that people suddenly stop on the road, or pull over, for apparently no reason. The reason is usually, that there is an animal sighting. Every time we followed suit, we were not disappointed. While driving through the Rockefeller Preserve, we noticed people pulled over. It took us a minute to figure out why… there it was, a grizzly bear walking along in the woods. This was the only place on our whole trip that we saw a bear. For Michael, it was the highlight of the day. Day 5 was a great day! Previous Our Western Adventure – Exploring the Basin Next Our Western Adventure – Rivers and Creeks and Waterfalls, Oh My!